When: Friday March 8th, 2019 from 6:30-8:30 p.m.
What is the Festival of Cultures? Please join us! Country hosts and performers needed. 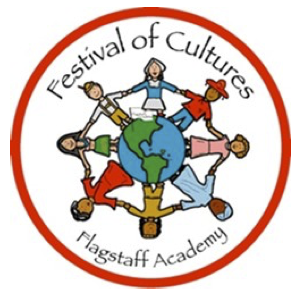 Share a country with Flagstaff Academy! Argentina, China, Costa Rica, Denmark, Ethiopia, Germany, Greece, Hungary, India, Iran, Italy, Mexico, Native North America (Kiowa & Chickasaw), Nepal, Peru, Philippines and Scotland.. If you hosted a country last year, you can host it again! You can choose any country or culture! Share a country you lived in, visited or know about! If you performed last year, you can do it again! We would love for you to be involved! Please register/sign in on our Dragon Volunteer Site to volunteer. For questions about the event please contact Zerin or contact Liliana, Committee Chairs.